What helps me unwind is my knitting. It helps me to focus on a pattern and all the other stresses of life just melt away. Recent studies have shown that complex crafting is good for your mental health. 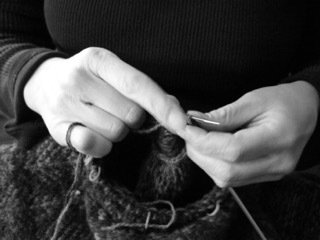 It is thought that the repetitive motion of knitting is liken to mediation. It is thought when we’re being creative, our brains releases dopamine, a natural anti-depressant, and knitting takes concentration so we have to engage our brain. It is thought that knitting can help alleviate depression and help reduce mild cognitive impairment associated with aging. It is also thought that it calls on parts of the brain that are being used less frequently in our world of modern conveniences. We live in a world that doesn’t take much thought or effort; we can pop our dinner in the microwave and have a meal in less then two minutes. Our brain needs to be used or we lose it and knitting is a perfect way to keep your brain healthy. So get out your knitting and you can relax, knowing that you’re are helping your mental health as well as your brain.